The main series of concerts at Bergamo 2019, arranged by Dave Douglas in his fourth and final term as artistic director, was again highly adventurous in its range of venues. It began with saxophonist Dimitri Grechi Espinoza’s solo performance Re-Creatio, in the Cathedral Museum – a subterranean venue that shows how the first cathedral began, in what would be the crypt of the present one. The saxophonist’s affecting, atmospheric performance complemented the beautiful display of medieval remains. The first theatrical event was an evening dedicated to the work of Bergamo’s most illustrious jazz musician, Gianluigi Trovesi, on his 75th birthday. The Teatro Sociale in Città Alta – the old town on this hill – featured his quintet with Israeli pianist Anat Fort. They began rather tentatively with what seemed like a performance on the fly, but eventually roared into life with the appearance of veteran trumpeter Manfred Schoof. The bell of the old tower tolled very appropriately and amusingly with the final chords of the set. The second set featured a Trovesi career retrospective performed by Bergen Big Band, which featured Schoof as guest. 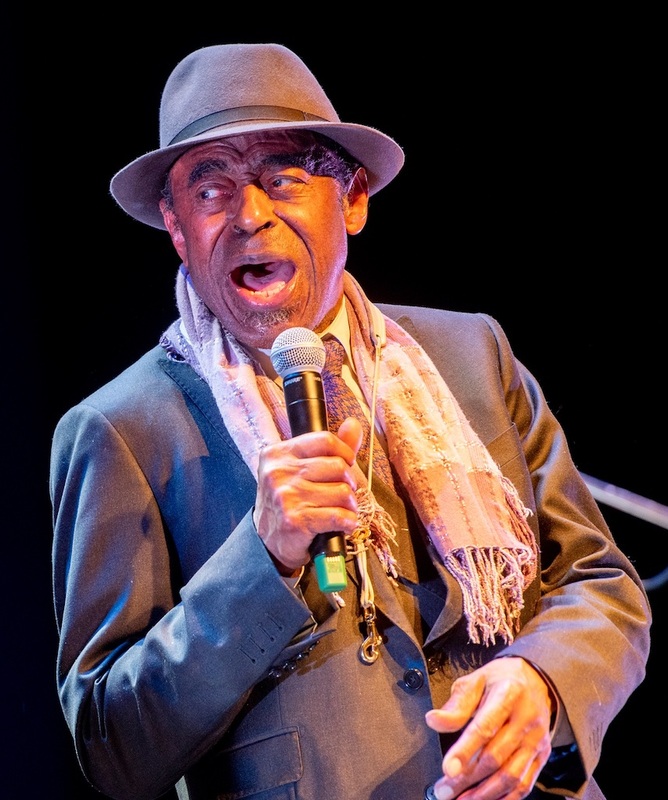 On Friday evening, Teatro Creberg on the edge of town – temporary replacement while Teatro Donizetti concludes its renovation – hosted Archie Shepp’s third visit to Bergamo, after 1974 and 2002. His exciting band featured French pianist Pierre-François Blanchard, Hungarian bassist Matyas Szandai and drummer Hamid Drake. Hope 2 was Shepp’s dedication to pianist Elmo Hope – a medium/up-tempo performance that reminded us of Drake unique abilities, equally in time and free contexts. Don’t Get Around Much Anymore saw a characteristically pungent Shepp vocal performance, while the pianist offered a fluent improvisation with clever use of dynamics. There was a gorgeous ad-lib tempo Wise One by Coltrane, followed by the Shepp original, dedicated to his eldest daughter, Une Petite Surprise Pour Mademoiselle. On Lush Life Shepp’s vocal was impassioned; the instrumental theme-statement had a Latin feel, followed by improvisations with a curious bounce that didn’t quite work. Shepp’s bluesy vocals seemed to resurrect the spirit of Jimmy Rushing. Revolution saw the leader unusually on soprano sax; A Flower Is A Lovesome Thing and a blues dedicated to Bessie Smith closed a long and memorable set. The second performance was by Terence Blanchard’s E-Collective – Miles Davis-inspired funk, though there wasn’t much inspiration, sadly. The set began sluggishly – turgid and soporific – and though the musicians tried to inject some urgency into proceedings, it was a lost cause. It’s hard to believe that a musician as talented as Blanchard could have thought up such a lame concept. The set opened with a Butch Morris composition – it sounded like Obi – in a performance about as far out as it’s possible to get with a swing groove. Bryant offered intermittent flourishes during Murray’s long and complex solo. Morning Song, the leader’s dedication to his mother, was a relaxed, allusive reprise of one of his greatest hits, showing how his material evolves. New compositions would now follow, Murray explained. The Music Of The Mind had a gentle Latin feel, contrasting with what was generally a rather abstract set. Cycle In Sense (Cycle And Sense?) had a whole-tone theme juxtaposed against a more familiar standard progression; Francesca was a gorgeous ballad. The set closed with a theme that seemed almost a blare or siren, in a furious uptempo. This is a band of outstanding virtuosity, that seems to be able to do anything, led by an immensely fertile figure. The second set featured Ivorian singer, dancer and percussionist Dobet Gnahoré, with the sound ramped up – I wonder why this vacuous Afro-pop was featured after David Murray. In contrast, the final evening saw Manu Dibango, Cameroonian singer and saxophonist, in an excellent quintet with guitar, keyboards, bass and drums, plus two vocalists. This was a cool set in which the leader’s alto saxophone was melodic, mostly light and decorative – but certainly a jazz sound. Of the octogenarian saxophonists I’ve heard lately, Dibango was certainly in the best shape. For the smaller events, Bergamo Jazz again found a remarkable example of the city’s architecture – the former Oratorio di San Lupo, a classical box-venue with small ground area but very high ceiling going up several floors, which the audience accessed via turret stairs. This was the venue for Federica Michisanti’s Horn trio, in a set of free jazz, powerful and expressive – Michisanti on bass, the mis-named (very speedy) Francesco Lento on trumpet, and Francesco Bigoni on tenor-sax and clarinet. The evocative venue also hosted the Sunday morning concert by vocalist Sara Serpa and guitarist Andrè Matos, in a wide-ranging programme with originals and standards. Serpa is a name new to me, but she has collaborated with Ran Blake, John Zorn, Guillermo Klein, Zeena Parkins, Mark Turner, Tyshawn Sorey and Nicole Mitchell. Cole Porter’s All Of You got an intense interpretation, followed by an original, Trees Falling, about the Portuguese colonisation of Africa. This segued via a solo guitar passage into My Old Flame, a song that needs Billie Holiday-style magic to rescue it from the inane lyrics. It was clear why her mentor Ran Blake recorded three albums with this singer, who is a thoughtful and sensitive vocal artist; Matos was very effective on guitar, with understated electronic effects including reverb and echo. The pianistic highlight of the festival was Jacky Terrasson, at Jazz Club Bergamo’s regular afternoon solo concert, at the unusual venue of Sala Piatti, with a solo programme of novel reinterpretations of standards. The Saturday morning event at Accademia Carrara, the main art museum, featured vibraphone-percussion duo of Pasquale Mirra (Campania) and Hamid Drake (Chicago). With Counter-Reformation paintings looking down on the musicians, this was a wonderful set of melodic free jazz. Drake muffled his snare drum with a cloth – “because of the room”, he explained. He later played solo frame drum: “I love the sound of this drum in this room”, he added. The third performance introduced a vamp very similar to Abdullah Ibrahim’s Ishmael. This was one of the finest performances of a festival packed with great music.